TORONTO — On the eve of staging their own international tournament that will pit best on best, the leaders of the NHL and NHL Players' Association are weighing the pros and cons of returning to the Winter Olympics in 2018. A new wrinkle in advance of the next Games in Pyeongchang, South Korea, centres around out-of-pocket payments the International Olympic Committee and International Ice Hockey Federation have covered, a practice the IOC has suggested stopping under president Thomas Bach. "It's not good to shut down, the question is whether or not it's worth it to go to the Olympics," NHL commissioner Gary Bettman told The Canadian Press in a recent interview. "You need to satisfy yourself that it's worth it." Bettman said a variety of factors had to be taken into account, from the players' desire to attend to the location of the Olympics to the "opportunities that come from it." "The sentiment is all things being equal we want to go," Fehr said. Bettman railed against the IOC's proposed changes to the payment model at the Stanley Cup final in June, describing the added costs as "many, many, many millions of dollars." Bach, who took over the IOC presidency shortly before the 2014 Olympics, is evidently uninterested in "special subsidies" of that kind. "Hockey is unique in terms of the Olympics because essentially, what is being asked, is shut down for close to three weeks, shut down your revenue, change your marketing approach, run the risk that the athletes are going to be injured and that'll affect the fortunes of their teams and ... and in addition, pay a lot of money," Fehr said. "So we'll have to see." 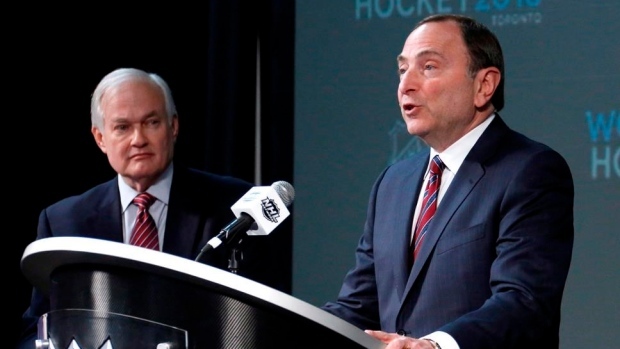 The NHL and NHLPA are reviving the World Cup of Hockey in Toronto next month. It's a tournament that could run every four years in various cities, though Bettman suggested that the league had not considered it a potential replacement for Olympic competition. The decision on Pyeongchang isn't imminent, the two men said, with Bettman adding that it's "not anything we're focused on." Fehr said he wasn't surprised that no decision had been reached yet. "For a long time now I've thought that there wouldn't be any real pick-up in discussions until sometime after the summer Olympics ended and things came back to normal," said Fehr. "I can't comment on the nature of those discussions and what it's going to take until we get back into it." Note to readers: This is a corrected story. A previous version had the incorrect title for Donald Fehr.